Sergio Franchi burst on the American showbusiness scene in 1962, with an appearance on the Ed Sullivan Show. That same year he began a seven year career on RCA Victor Records. Sergio had been a popular star in Italy in the late 1950s and before that a classical opera tenor in South Africa. RCA obviously was looking for a replacement for Mario Lanza. Sergio wasn't that, but he was top-notch in his own right. Instead of going into films, he became a frequent singing star on talk shows, entertainment variety shows and Las Vegas. He had a way with swinging pop songs as well as a romantic ballad or opera aria. In addition he was a very handsome man. Women loved him and he had a three decade career, until his early death in 1990. He had made a few albums before his major career started in the USA, but his best work was for RCA Victor. Here are some of the Franchi Lps I have enjoyed for decades. The first few years they were on the prestigious Red Seal, then later Black Seal. He made a few other Lps for other labels but his reputation rested on his work from the RCA Victor albums of the 1960s. This is just a sampling of Sergio's recorded work. There is a wonderful clip on YouTube of an operatic duet with Julie Andrews, singing the duet from "Samson et Dalila," as well as his wonderful version of "Speak Softly, Love." Franchi's first RCA Red Seal Lp from 1962, featuring famous Italian/Neapolitan songs, it still holds up well today and is now on CD. Favorite songs include Funiculi, Funiculi; O Sole mio; Core n'grato; 'a Vucchella; Mamma mia; Torna a Surriento and six more. He is in splendid voice, presenting a lot of personality and vigor as well as exciting top notes. The album "wears well" on the ears and is one of his most-famous. This Lp was released in 1963. Great romantic musical theater music...two great voices singing it. 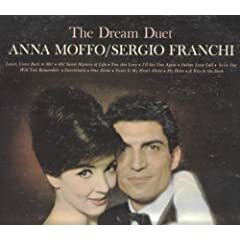 Pairing Franchi with Anna Moffo was inspired casting. The music is Romberg, Herbert, Friml and Oscar Straus. Lovely duets of "Ah, Sweet Mystery of Life," "Someday," "Sweetheart, Will You Remember" and "My Hero." Really a grand album of this old-fashioned yet timeless romantic music. 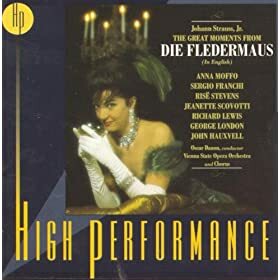 A wonderful English language highlights from 1963 of the evergreen "Die Fledermaus" by Johann Strauss, Jr. Franchi sings the music of the bounder Alfred. Moffo stars as well as Rise Stevens, Richard Lewis, George London, John Hauxwell and Jeanette Scovotti. Lots of fun and really a great album now in this spiffed-up CD production. I used to play this album over and over...a 1964 "live" nightclub performance of Sergio's, at the famed Cocoanut Grove, where he appeared for many years. He sings a dash of everything--opera ("Tosca"); Italian song and lush pop standards. He is in terrific voice and his winning personality shines through the vinyl. Released now on CD as a twofer including "The Exciting Voice of Sergio Franchi." A must for his fans! A good old-fashioned Broadway music romance from its Golden Age. 1965. This was based on the film "Summertime in Venice" which starred Katherine Hepburn and Rosannno Brazzi, in 1955. Sergio plays the smoothie and has two wonderful Richard Rodgers/Stephen Sondheim songs--"Someone Like You" and "Take the Moment." The entire cast is first-rate and the songs fun. Now on CD. Franchi, as is obvious from the other albums, had a way with a good, solid show tune. This 1965 album was dedicated to the melodies of Richard Rodgers, with various lyricists--Hammerstein; Hart; Sondheim. "This Nearly Was Mine," "My Heart Stood Still," "Climb Ev'ry Mountain, and "Bali Hai" are just four of the twelve well-known hit songs. Some interesting arrangments, also. Not yet on CD. Seek this out on Ebay or from reputable used vinyl dealers. Released in 1968, this is a "staged" evening at an Italian bistro. "Lonely is a Man Without Love," "Time Alone Will Tell," "Al di la," If I Were a Rich Man," "C'est magnifique," and "The Impossible Dream" are the standout songs on this unique album. The good-natured enthusiasm is a little overdone, but if you can get past that you'll enjoy this album. Not yet on CD. I think this might have been Sergio's last RCA album, excepting compilation collections in the 70s. 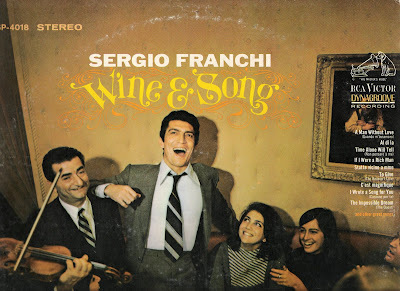 So, that's my brief overview of some of Franchi's best Lps. I just bought from an Ebay seller the 1966 "La Dolce Italy." It is fabulous. I certainly hope more than five of his Lps make it to CD. Until then, search out his vinyl Lps--all good to great. Happy Listening!